Oil on canvas…found tree fragments…tinker toys…recycled Styrofoam. Add a deeply-held conviction about humanity’s relationship to the world and you enter the world of Linda Vallejo. Growing up in a military family, living and studying abroad, Vallejo’s life experiences have been shaped by many cultures, teaching her that nature and natural resources belong to all. Her work reflects a deep appreciation for the enduring beauty of nature and an awareness of our responsibility to protect our natural resources. She explores the two-edged sword of our destruction of nature and, conversely, the power of nature to heal and console. Her work is influenced by Spanish and Mexican artists Rivera and Siqueiros, American artists Rothko and O’Keeffe, and contemporary artists Ana Mendieta and Lee Bontecou. 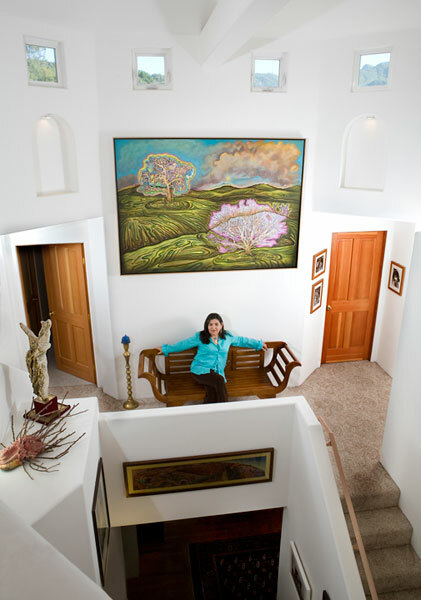 She also draws emotional depth from Native American and Mexican ceremonial traditions and symbols. She asks, “Can we reconcile our relationship with nature, its beauty and strength, with our destructive, violent nature?” Her art takes us on a journey to answer this timely contemporary question. Linda Vallejo’s documentation took place in 2009 and was sponsored by Jim and Meg Easton. The FOTM Archive contains extensive information about this artist.